The number of deadly weapons in the wrong hands in parts of Nigeria, is a scary situation, to say the least. The Force Headquarters’ Joint Task Team, led by the Deputy Inspector General of Police (DIG) Joshak Habilla, has recovered 2,753 illegal firearms from only 13 states. Following what was described as an impressive turnout of the exercise, Inspector General (IG) Ibrahim Idris has extended the ultimatum for recover of illegal arms to April 30. The IG initially gave a 21-day ultimatum, which began on February 22 and will elapse on March 14, for members of the public to surrender illegal firearms in their possession. 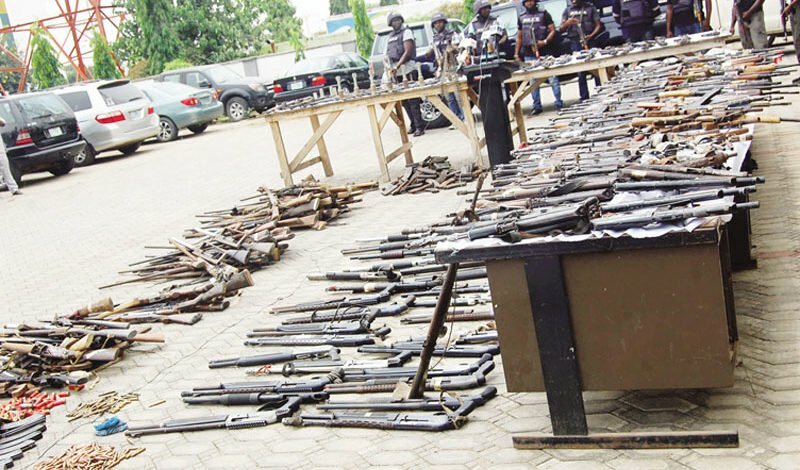 Force spokesman ACP Jimoh Moshood, while parading the firearms at the Force Headquarters in Abuja, said the Joint Task Team was still collating the firearms from the states. He said 425 illegal firearms arms were recovered by the team in the Federal Capital Territory (FCT) during raids, stop and search operations carried out by the team’s personnel. two General Purpose Machine Guns (GPMG), 114 AK47 rifles, eight SMG rifles and 301 other assorted guns. He added that Abia recorded 1,380 recovered firearms so far followed by Lagos with 200 and Katsina with 198. Moshood said: “So far, 1,380 firearms have been recovered from Abia State and that happens to be the highest recovery made. We recovered 200 from Lagos, 198 from Katsina State. Moshood added that 14 firearms were recovered from Adamawa and 12 from Delta. He also said the arms recovered would be investigated by the Force Armament Unit to ensure that the arms were not used for criminal purposes in the past. The Force spokesman, while noting that the operation would continue, urged the public to report to the police anyone suspicious of bearing the prohibited firearms across the country through the following lines; DIG, Department of Operations: 08037025670, O/C IGP Monitoring Unit: 08032451594, O/C IGP Special Tactical Squad: 08036783383 and O/C IGP Intelligence Response Team: 09098049333. On the extension of the ultimatum, he said: “The IGP has graciously extended the ultimatum for another 21 days with effect from Monday, April 9, 2018 -April 30, 2018. He allayed fears that the police would arrest anybody who willingly surrenders the weapons during the extended grace period.